Extreme STRENGTH and FLEXIBILITY can now be Yours! Everything You Ever Wanted To Know About Splits and Flexibility DVD! ON SALE NOW! FREE RESISTANCE BAND WITH EVERY DVD!!! "When i started this i couldn't lift my foot of the ground but as i was doing what you said in the video my flexibility increased drastically !." - Bountie I.
Hello - I purchased your book some time ago, and I wanted to make it a point to report back with my findings. Here it is: I can do the front splits with either leg in lead, now. I've been concentrating on these splits, first, as I had the most flexibility this way, to start with. I am so tickled - next summer I will be testing for my black belt, and for some reason, I feel more polished and genuine just because I can do the splits. I know that sounds silly, but it's just how I feel. I am so happy to see that your advertisements are truthful - you definitely get what you put into it, and when stretch and strengthen on a regular basis ( I have also been working on some basic yoga poses) I feel much more limber and agile, when sparring. Thanks so much - I am recommending your book to my friends.-Thanks,Sheyna. Strength & Flexibility Book to life! "Just wanted to say a massive thankyou to Mister Zaichick, as I used to be fairly flexible but tore a hamstring a while ago overstretching, and as such did not stretch for a long time and lost most of my flexibility..
Everything you need to know is compiled in this incredible 2 hour, information packed DVD. Simple and straight forward, with easy to understand percise instructions and follow along routines that you can do along side Paul Zaichik himself from the comforts of your home! "It's just a hair short of two hours..and two hours with Paul is like four hours with most of the time-wasters that sell DVDs. This is nothing but moves-moves-moves, with short, insightful explanations about the underlying common aspects of all the stretches for any given muscle. I know more about stretches now than after all the other books and videos I've seen, put together. This is the single best exercise DVD out there, for it's combination of quantity and quality. I have no doubt that he has continued to find a wealth of other high-quality exercises that he hasn't had a chance to release. As stated previously this DVD is your one stop for ALL the knowledge you need, to achieve the flexibility that you have dreamed about for years! Learn how to make your life's long dream of doing a 180 degree front split, side split and true front split come true! Warm up the RIGHT way! A variety of Stretching Exercises that will safely guide you into your 180 degree split! Develop Flexibility That Todlers Will Envy! Hello. I've been working on the exercises from Elastic Steel for a week. I simply can't believe the results. Maybe this sounds like a stupid advertisement but so do the other messages I read about people that had the same experience. Actually I noticed something "new" on my legs right after the first session; my knees didn't hurt at all, and when I finished with the hip turns I stood up, I threw a kick and I laughed!! My hips didn't click anymore, and moving my legs was just like moving my arms. Also, I used to have a slight pain in my quads every time I attempted a front split. Guess what? It's not there anymore; all the previous exercises you do before the split seem to have kind of fixed it or whatever. So, now you know, if you still have some problems with your hips or something similar keep on doing the conditioning exercises and the techniques explained in the book. Never give up. Thank you Paul!!!!!!!!!!!!! Regards. -Daniel, Buenos Aires, Argentina"
Click here now to order the only DVD you will ever need to get 180 degree splits in no time! Order today for only $49.95 Save $10.00 off regular price and you will also get 1 Resistance Band FREE of Charge! Find out how to take the advantage of your body’s natural wisdom to painlessly boost flexibility. Thanks to Paul Zaichik's brilliant easy to follow and understand instructions, the power of "Secret Flexbility" knowledge can now be yours! Unlike any other work on stretching, this DVD details a very important aspect of flexibility training; Tissue relaxation through the use of massage. Paul demonstrates how to precisely massage each muscle and tendon responsible for split flexibility. Massage is a privileged secret companion to stretching of many elite athletes. It has long been proven that any time you take two people of the same ability, stretching side by side, the ones whose muscles are loosened through massage will get faster and easier results. It's a fact - massage is a tool that can take your flexibility beyond a wall that you have hit years ago.And in this very video you will learn two types of massage techniques. Each is capable of giving you an ability to stretch further and deeper every time you stretch. "Got the book on the thursday before christmas and have spent the last 3 weeks concentrating only on side split conditioning exercises. anyone who read my previous post will have read that my hips were in agony & i was stuck at about 1 foot away from the side split. Today i decided to do the whole routine for side split including massaging with the castor oil but i didn't really expect to see much difference. the result ???. I even had to shout my wife to come and see me as i was so excited. I ABSOLOUTLEY LOVE YOU PAUL !!! six inches away from the split. (six inches) i couldn't beleive it, anyway for those of you unsure about whether the program actually works get stuck into the conditioning before you bother with stretching( my mistake over the past 16 years) and you will honestly see results. Cheers paul! -Sean"
Posture is a much neglected part of training. May be it should not be.Think about it. What two types of physical performers are most know for their flexibility? Dancers and gymnasts. Guess what? Have you seen their posture? As a rule of thumb, they have perfect postures. Most flexible people, place great value on posture. Resistance to stretching is less when the muscle is strong in specific ranges. Properly warmed up and strategically fatigued muscle tissue much more welcoming to adoption of increased length. Have you ever watched a mixed class of students stretching, in martial arts class? The youngsters who can do the split at the beginning of a class can do it at the end just as well or better. The adults on the other hand who suffer to get into the position at the begging of class still suffer at the end. Unfortunately most flexibility challenged don’t get more flexible with each passing month. Most of them would, if only they had warmed up properly! Even with those poor quality stretching instruction that are now the norm; "Alright guys, spread you legs. Reach for your left foot and now for the right, and now reach forward. Ok, done with stretching, moving on.” Sounds familiar? Unfortunately most instructors are not experts in flexibility. If they were, you would be splitting with ease and not reading about this DVD! If you have read the book, you know the power of progression. You know how the right sequence can uncover your flexibility potential. The book contains only one sequence, the fact is, it’s not the exercises that you use that matter but which muscles you stretch in relation to others. The DVD covers all the stretches for a specific muscle in the scientific sequence. You get to pick the exercises that you like for each muscle group. You also get a sample routine to follow, while you are choosing the most comfortable exercises for you. These are split specific stretches. Armed with split specific warm up and the massage techniques, split specific stretches will melt your legs into the split faster than you ever thought possible. Here you will learn moves that give your nervous and muscular system strength and confidence that allow you to achieve splits safe and fast! Every exercise is demonstrated as body weight resistance first and then with the resistance of the elastic band. You get a choice of the exercises so; you always stay interested and focused throughout your training all the way to full splits. The commonly ignored joint rotation is demonstrated in the proper sequence. This is an essential part of the safe and effective warm up. The goal of this DVD is straight forward and simple. It was made with only one objective in mind. To enable you to achieve full splits. As a by product you will experience an improved posture, stronger and more defined legs and mid-section. Learn to be in control of your breathing. You will also get rid of impurities from your lower body. What worked for thousands will work for you, if you devote yourself to this program. Take Charge of your flexibility Click here now to order the only DVD you will ever need to get 180 degree splits in no time! Order today for only $49.95 ($10.00 off regular price) and you will also get 1 Resistance Band FREE of Charge! Let me be straight forward. Everything written above can be achieved and relatively fast. One thing must be clear; nothing happens overnight. If that’s what you expect, then my method is not for you. There are plenty of people that offer to double your flexibility and strength in one evening. Try their method, and then come back to me. If you are not hurt after trying their scams, I will gladly show you how to achieve everything, I stated above. Just make sure those clowns have a money back guarantee. Once the over-charged money is returned to you, get my manual and DVD. It costs a fraction of what the rip-offs out there charge. Let me tell you what Elastic Steel is and how it is different from all the other methods on the market. Progression is the key to this method. Scientific progression is a lot more than: “start slowly, warm up thoroughly, and stretch before a work out”. Let’s talk about stretching shall we. Muscles in your body are connected and intertwined. To stretch a muscle properly, other muscles that restrict its flexibility must be pre-stretched. Sit down; pull your toes toward you as much as you can. Do one leg at a time. Now reach forward. Remember how far you went. toes and point them away from you. Feel the difference? Of course you do! You probably have noticed this effect a long time ago. Why can you reach forward more with toes pointing away from you? The answer is simple: Calf has an influence on the flexibility of the hamstring. In order to get a maximum stretch out of the hamstrings, a few muscles must be pre-stretched. Calf or the back of the lower leg is one of them. Don’t worry this method is not for rocket scientists. It’s for a everyday people. I do explain the purpose of every exercise, but the demonstrations, require no reading. Just follow the illustrations and you will achieve both flexibility and strength! Let me tell you another way that this method surpasses other practices out there. I use natural concepts. Gymnast and dancers used them for years. Physical therapists employ these principals every day. Martial artist however do not - oh well, where would they learn from? HERE! This is the place where these concepts are discovered. 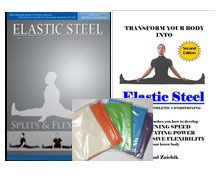 Click here to get ther ElasticSteel Book & DVD set that will have you sitting in a 180 degree split in no time! Order today and you will also get 5 resistance band FREE of charge! I will mention two important concepts. Deep range conditioning (extended length conditioning), being one, and reciprocal inhibition, being the other. Both are needed to sit in a split and have breakfast while doing it! Go ahead; place your arm behind your back. Now have someone hold it. Try to bring your arm in front of you. Can’t do it, huh? Well, that’s what your body is afraid of. Your body’s intelligence does not want you to be stuck with your arm behind your back, or your leg ahead for that matter. That is why your stretch reflex prevents you from becoming flexible. Now if only you could get strength in these unnatural positions, then you can convince your body, that you would not get stuck sitting in a split forever. Your nervous system then would not be so nervous allowing you to become flexible. This is what deep range conditioning is all about. Reciprocal inhibition on the other hand is body’s own trick mechanism. You see, if you try to arm curl some weight, using your bicep, the triceps muscle must relax and give way. If it doesn’t, then the biceps will have a hard time lifting the weight. To our luck, when one muscle contracts, its opponent relaxes. Reciprocal inhibition takes advantage of this principle. Below is an example. Notice that after holding the second position demonstrated, you can go slightly more forward (try it a few times) this is the reciprocal inhibition at work. "I love the books you had written with the exercises. The exercises presented in the book are state of the art, light years ahead of anything exercise program I have thus far seen. Thank you. – Craig Breuwet, USA"
Now let me tell you precisely what my Strength & Flexibility Book will teach you. Proper order of joint warm up - Lubrication of the joints in scientific sequence: which prevents injuries, awakens the body and prepares it for future use. Pre-stretches sequence - This is the sequence, which gets major lower body muscles prepared for speed and power of the kicking technique, as well as elasticity of splits. Mobility Swings - It’s a great warm up technique as well as injury prevention skill. 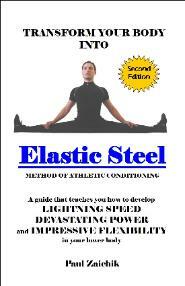 Static and dynamic conditioning - This is the bottom brick of the ElasticSteel method. Muscle strength and isolation is developed for further use in stretching and kicking. Extended Length Conditioning - This exceptional system of exercises stretches and strengthens muscles in very unique ways. Stability circles - This great technique, teaches balance and ease needed to develop speed and power of the leg techniques. Leg raises - Leg raises are extremely important techniques to get the legs ready for flexibility, while executing high speed movement. Reciprocal stretches - These are techniques based on body’s natural tricks. Flexibility is enhanced, pain free. Deep stretches - Progressive techniques to maximize flexibility. Remember sequence is the key! Unlike many programs out there, Elastic Steel doesn’t require you to go to the gym. You don’t have to buy any weights, cables or pulleys. There is a piece of equipment, however, that will greatly speed up your progress. It is the elastic resistance band, and I give it to you with Book or DVD at no extra cost. So what are you waiting for? Start training right now! Enough time wasted. Get the Book right now. And soon it will be you sitting proudly with your legs 180 degrees apart. Make a decision this moment to throw 6 o’clock kicks, straight up in the air. Your legs will thank you for it. Still not convinced that my training method is the RIGHT choice for you?! "As a martial artist I believe that if you can’t say something about some, don’t say anything at all. I am not going to trash anyone, but I would like to share what happened to me a year and a half ago. I am 51 and I practice tae Kwan do. I like to compete, that’s what I do in my spare time. Any way, my kicks are strong, so are my punches, but flexibility is where the problem was. I always dreamed of scoring points with kicks to the head. I also wanted to be able to do a split, but I accepted that fact that at my age I may never achieve it. One day I was competing in a tournament in New York, and I saw an ad. in a locker room. There was a seminar after the tournament. The promised to double the flexibility in one evening. I try plenty of those before, and it was B.S. I decided to try it since; they said that if the flexibility was not doubled, they would give money back. I had nothing to loose, just 90 minutes of my time. So I stayed for the seminar.When I paid (a good sum of money) I was given a card to fill out. At the beginning of the seminar, they asked me to sit on the floor and open the legs, and then they measured the distance between my feet. (It was 59 inches) For the next 75 or so minutes we did different exercises, tons of them. Some of them I did before, some of them I have never heard of. We did a lot of stretches and a lot of calisthenics. Finally they asked us to sit with legs open again. This time the distance between my feet was 66 inches. The flexibility did not exactly double, but it was better. I never measured the distance before, so I had not idea if I did better than in my usual Tae kwan do class. I went home not sure what to think. After all, I did not get a full split. And for me to get more flexibility I need to practice those exercise on my own. How ever they did not give any hand outs, and I forgot most of the stuff. Well next 3 days were hell. My legs were so stiff, that I could barely move my legs apart. (37 inches to be precise, since now I measured it.) The bad thing is, after the stiffness went away, my flexibility did not increase a bit.I did not mind the pain, but I don’t like to be cheated. And my money don’t exactly fall on me on the street. I will hold on to my creed how ever and will not give the name of the person or the tournament that preceded this B.S. seminar. Less than six months ago, I was looking things up on line and found. Elastic Steel website. I saw the pictures of Paul Zaichik doing his thing. Honestly I thought that it is one of those B.S. things. I was just wondering why the price of the manual was only 22.95. I thought it was total garbage, especially for that price. It’s hard to blame me, since I tried so much stuff, and it was all in vain. I don’t know why but I bought manual. I email Paul, and to my surprise he emailed me back. He told me that, I must follow the method the way it was in a manual. I was not very happy that, it would take me a few months to actually begin to pracise deep stretches. How ever, I got my son into it and we both decided to do it. To make a long story short, I can do side split and a front split with both legs in front. I also go to the tournament and score with kicks to the head, both legs equally. P.S. now I know why I was able to improve my flexibility slightly at that seminar. It is because they tested us cold and than warmed us up for over an hour, no wonder we all go more flexible for that instance. Any way, Paul G-d bless you. And thank you Alex for working out with your old man. -Mark Zatkovetski New York, N.Y."
"Ilike the Elasticsteel program. It is diligently put together. I was not forced to run around the bush and try to figure out how to do things. Everything is easy, and right there. -Marry Goldfeld." "Focusing on stretching, this way getting the splits is rather unique. My favorite part of the book is the extended length stretching. -Genel McGinney"
"As a dancer, I am always concerned for my hips. I know that increasing flexibility, can cause my hips to be long term injured. I tried many ways of conditioning my hips to prevent injury. I spend years on weight training, weight machines, yoga, Pilates. Still my hip clicking and pain was getting worst. Now it’s been about 6 weeks since I been practicing hip turn in and hip turn out, stability circles and extended length conditioning. My hips are getting stronger and it’s getting to the point where I don’t have to constantly worry about injuring them. -Lisa Huang"
"Hi there, I am a part time sport karate instructor. I am glad that I gave your book a shot. My kid students very often have problems with control and clarity of the kicks. And almost every other adult student can’t easily kick to the head. Your book gave me a powerful arsenal of tips and techniques that I now use. Thank you very much. 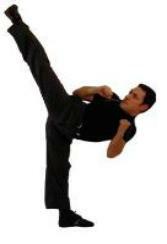 -Master John S."
"After a month of kick specific training, the power of my kicks have improved. Plus I can kick with the total control of my hands and my torso.- Charles Gavigan, Galway Ireland"
"Training with Elasticsteel program proved to me that if you train right, you can quickly notice steady results.-Max Deluca San Jose, California"
"I feel that my stretches have helped me more then improve flexibility. I used to get frequent back pain. By making my hips and buttocks looser, I rarely get the pain. When it so happens that I get it, it takes a 2-3 days for it to go away and not weeks.- Nasher Bibi"
"If I would have found this website earlier my flexibility training would have been different and safer. Better late than never.-Frank Wilson Pushmataha, Oklahoma"
"Hi! I am an Italian Elasticsteeler and I've received the book this morning. At the first look I've been surprised by the little size of the book, but after opening it, i've understand why. Unlike many other flexibility books, ES is a concentrate of pratical stuff and techniques.No waste of space, no tedious theory. Today I will begin my training. I like this book." Buy them together and save over $30.00 plus get 5 resistance bands FREE of charge! Click here for more information! If the items in your order which qualify for 'Free Shipping' total $99 or more, your order ships FREE! Regardless of where you live! Valid for International Orders too! Below is a list of frequently asked questions. We hope this helps, but if your question is not answered please email us at sales@elasticsteel.com and we will promptly assist you. Q. I live outside USA will your DVD’s play on my DVD player? A. Nearly 50% of those practicing ElasticSteel Method are from outside the US, and we haven’t really had any complaints on this issue. However, should it fail to play on your DVD player, just let us know by writing to sales@elasticsteel.com and we will rectify this situation. Q. How much will it cost in my currency? Q. Should I get the Strength & Flexibility Manual or the Everything You Ever Wanted To Know About Splits & Flexibility DVD? And really what is the difference between the two? A. It all depends on what your goal is, and how you absorb the information. Some people are better at reading a book and understanding it's content, while others learn better by following along to a video. There are differences between the Strength & Flexibility Manual and the Splits & Flexibility DVD. If you are looking to strictly learn how to do the splits and get flexible, then you should probably purchase the DVD which goes into details and gives you absolutely all the necessary information on how to safely achieve splits and get flexible. While the book covers flexibility and splits as well, it also contains a section on how to get high, powerful kicks. Hence, if you are looking to get high powerful kicks and want to learn the basics of getting splits and flexibility then you should get the manual. If you want to get flexible and be able to do splits with ease, then you should purchase the DVD. The DVD doesn’t have any information on kick specific training. If you want the benefits of both worlds then a special DVD & Book combo is the way to go. By purchasing these two items together you will save money and get 5 resistance bands free of charge. For more information please click here. Q. I'm past 40 and have never been able to do a split in my life. I've tried everything I could possibly get my hands on. Will your program help me, or is it too late? And what makes your method different? A. It is never too late to become flexible. Yes, the ElasticSteel Method will help you. Why am I so confident? Because I have hundreds of people writing to me everyday telling me about how my method has helped them. But that's not the only reason. You see every person is unique, and everyone needs a specific approach to their training. The reason that ElasticSteel Method is so successful is because you choose what's best for YOUR body. The reason you weren't successful in the past is simply because you were not doing what your body needed. With the ElasticSteel Method you'll become more flexible and be able to do splits with ease, safely. My number one priority is always to make sure that whatever program I put out there is SAFE. I do not promise you to get flexible overnight. Because it is NOT possible. Also, by simply purchasing my books & videos you won't get flexible either. You actually need to work on your flexibility by following what I teach you to do and listening to your body. Q. How long will it take me to get a split? A. I’ve stated this many times over, there is no one answer to this question. It all depends on your current level of flexibility and how much time and effort you’re ready to put into achieving your life’s long dream. Most people report increased flexibility within days of trying the method, others say it took them a few weeks to get their splits, still others are reporting it’s taking them a few month to achieve full splits. Hence, it all depends on you. On average, it is safe to say that around 6 – 8 weeks will get you the results you’re looking for. If you stumble along the way you can always contact me for help or visit the forum we’ve put together to keep you on the right track. Q. What if after I purchase your products I get confused will you help me? A. There is a whole forum dedicated to helping you with ElasticSteel Team and your fellow ElasticSteel Practitioners ready to lend you a helping hand, encourage you and answer any questions you may have about the method. However, should you need my personal assistance, I will be glad to help you, although it may take 3 – 4 days for me to get back to you, since I travel extensively. Q. How do I know that your method is any good? A. The only way to find out is to try it and see for yourself. In the meantime you can read other’s reviews of it on the forum or try googling for reviews. Q. It says that the DVD is 2 hours long! I don’t have time to devote 2 hours everyday to this program! Will I really have to follow the DVD for 2 straight hours daily!? A. Absolutely NOT! The reason the DVD is 2 hours long, is because I wanted to give you ALL the information you would possibly ever need to get those splits! I show you every routine imaginable, every trick in the book so that you can safely and steadily reach your goals and keep it up! You do not need to follow the DVD for 2 hours every day. All you need to do is follow the suggested routines outlined in the DVD insert and choose the routine that’s best for YOUR body. Then choose from the DVD menu the part that you should be following and get started! Q. I’m a dancer/cheerleader/hockey player will your program help me!? A. ElasticSteel Method doesn’t discriminate what you choose to use your newfound flexibility and splits for. Hence, the answer to this question is a definite YES! Q. Okay so I am completely confused, what really is the difference between the two? Do both of them contain the same exercises? Is one a continuation of another!? Do I get GA and then GAM? A. Gravity Advantage and Gravity Advantage MAX have only one thing in common, both teach you how to utilize your bodyweight only to achieve great strength and build a powerful, muscular body. There’s only one section that’s the same in both books, that’s the joint warm-up routine, the rest is different. Gravity Advantage only targets upper body, with mid-section as stabilization, while Gravity Advantage MAX is a total body, each group together and in isolation, with maximum bodyweight resistance conditioning. If you do not have any equipment Gravity Advantage will show you how to workout every muscle in your upper body using only 2 chairs, a stick and a stack of books/two yoga blocks. · Eleven joint warm-up exercises. · Four progressive routines containing six exercises each. Gravity Advantage MAX on the other hand, takes bodyweight exercises to a new level. This book covers your ENTIRE body, isolating each muscle group and giving you a workout of a lifetime. You should have some equipment at home, such as a pull up bar and a dip bar, a bench, etc. as GAM uses common equipment. To read more about what GAM has to offer please click here.